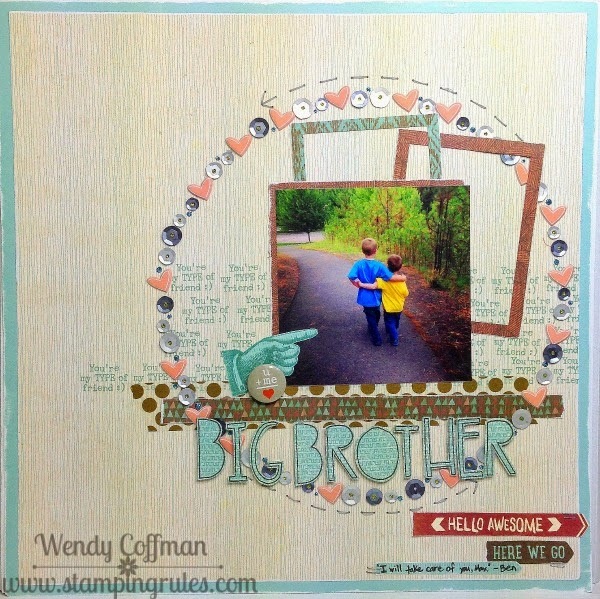 Welcome to the April Stamp of the Month Blog Hop! This month we have over 60 consultants sharing awesome ideas using the April SOTM, Typed Note. Typed Note is a set of 13 stamps with lots of sentiments and a vintage flair. You might be arriving here from MELISSA'S BLOG. Let's Hop! I made this layout using the SOTM and (mostly) the new Jackson paper packet (released April 1st). I was working on a #PICrop challenge to use 6 or more patterns in a page, so the only CS on the layout is the sanded Glacier base. I used an April SOTM sentiment to stamp a line of text across the layout base. I stamped the pointing finger and my one line of journaling onto a smidge of Blossom B&T (also available April 1st). I used the Hopscotch alphabet stamps on the Jackson B&T to make my title - these are super easy to fussy cut. I popped those up with foam tape. The flair is from the HeartStrings assortment - you got yours before March 31st, right? I used almost two sheets of Silver Sequins to build my circle and a lot of sorbet puffy hearts. Then I stitched around the circle of bling with 4 strands of grey sewing thread. I used the stitch guide to guestimate how far apart my holes should be while following the curve of the circle I'd placed. Don't forget that Typed Note will only be available until the end of April. Click here to order yours or ask your consultant how you can get yours for just $5! Next up on the hop is CAT'S BLOG. Have fun checking out all the Hop goodies! Well worth the package of sequins! This came out so cute! Fabulous layout!!! Love the circle with the sequins, hearts and bling. LOVE this layout... all the little details and the unique use of the STOM are just perfect. Oh my gosh, this layout is ADORABLE!! Love the love you capture between your boys! Your layout is UNBELIEVABLY AWESOME! You have just outdone yourself here, and upstaged everyone else. This is just stunningly beautiful....love it. and I think this is my all time favorite. oh Wow! This layout is awesome! I love the mix of products and colors. Wendy, this is gorgeous! Love the circle element sooooo much! I'll have to recreate this one someday! Love! I always love your work. It's so eclectic! I don't think I can come up with the words to say how much I love your layout. The April SOTM looks fantastic on it. 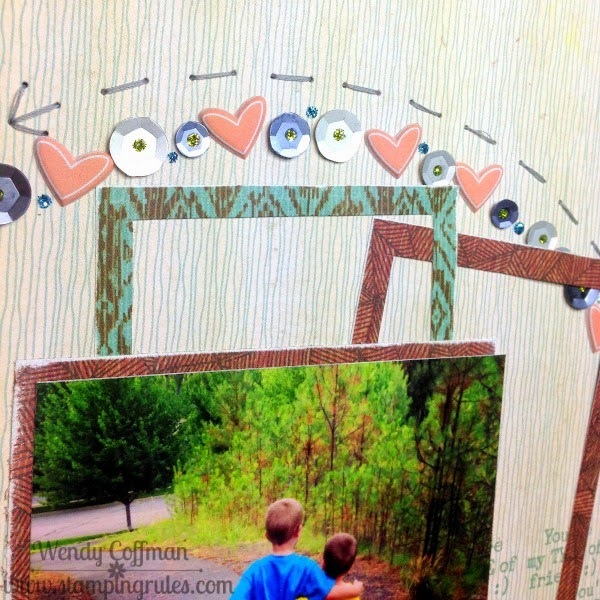 Oh wow, this is an absolutely adorable layout! I am in love with this as a mum of two boys, and think the idea is great! Very nice page, with lots of great details.